This particular piece came about from an art group I started at work. Each month we do a 10x10 piece based on a theme. I'd created a Fido Kahlo (Pug) painting a few years ago for a Cinco de Mayo show and remembered how fun it was to paint. I originally thought the big beads of the necklace would serve as the "circles" but decided on a graphic nod to 'sky' - small blue circles that would make a tie-in to the theme more blatant. I've never been a series painter, but I think that I'll make an exception for the Fido Kahlos. Started another painting! I'm loving being in my studio day after day. I'm a happy lady. Painted Hills. First, amazing. You most likely have never seen anything like it. Ever. It also happens to be the "easiest" or "closest" to visit. Quotes "" meaning 2+ hours from Bend rather than 3+ hours to get to Sheep Rock ;) Regardless, a lot of people go there. They may not make it all the way to Sheep Rock and Blue Basin, which is a real shame, but happily, that section does get a lot of visitors. Truly, it's like another planet. Nothing to see but colored striations of reds and golds, some blue and purples, and a lot of orange red. Color. It's everywhere. And not just color.... Folds. Fingers. Jutts. Burps. All kinds of crazy formations, it's fantastic. Best Christmas present: a solid week of nothing but painting in my studio! Rarely do I have the opportunity to paint multiple days in a row. Well, unless it's the weekend and I have nothing else to do! Usually I paint, I run errands, I do some cooking, I hike, I garden... but not Christmas week this year. I painted! Selfishly, unapologetically, I painted. All day, every day except Christmas Day. It was glorious! I wanted to finish the Sheep Rock painting I'd started in November. This was such a fun painting. One of my favorite things I've realized is that when I'm painting these larger landscapes I absolutely remember standing outdoors, painting the scene en plein air. I remember if it was hot, if it was windy. I remember if someone came by, if I spoke to them. Painting these paintings in my studio is like creating a time portal. I love it. Sheep Rock is so spectacular. It's rhythmic, heroic, and fittingly the 'icon' for the park. The Visitor's Center at John Day Fossil Beds looks out to this mountain. Visitors sit out with their lunches at picnic tables and admire its unique beauty. My last day at the park was spent painting this scene. I think it's amazing. 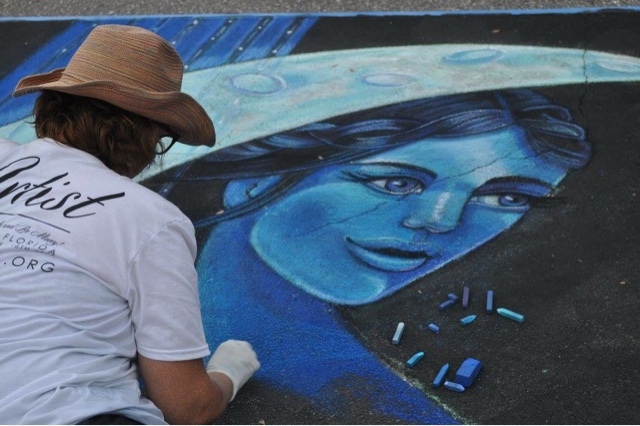 ... And that was the theme for the 2015 Sarasota Chalk Festival held in Venice, Florida. FLORIDA! A mad dash, red-eye flight, crossing of fingers to make it both in and out of Denver in November, and a 5:15am arrival in Tampa. Ooh, tired eyes, crooked neck and very excited heart! Sketch and color study in hand, I signed in at the Festival office and Set out for Miami Avenue. For the Eat Drink and be Merry theme... I knew I didn't want to create an image of anyone eating and definitely not anyone drinking, that made Merry my inspiration. Merry; I started thinking of laughing, happiness, joy, spinning, twirling, dancing, music. MUSIC! After some sketching of people dancing followed by others of musicians, I drew a woman holding a moon like a Lute or Bass. 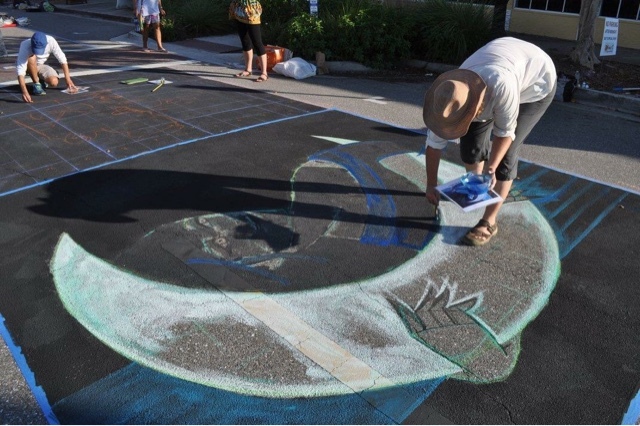 Moon = Luna: Luna and Music: Luna's Merry Music of the Spheres! Okay that last part is a bit of a jump, but after I'd finished my sketch and color rough, I was still massaging the title of the piece. I sent the art to my Mom and Sister and my Mom wrote back that made her think of The Music of the Spheres. Huh? What? Thank you Wikipedia- I soon learned about a long ago concept of Pythagorous which in its essence describes the planets as consonants and whole notes - celestial sounds and music. Perfect! "Luna's Merry Music of the Sheres." 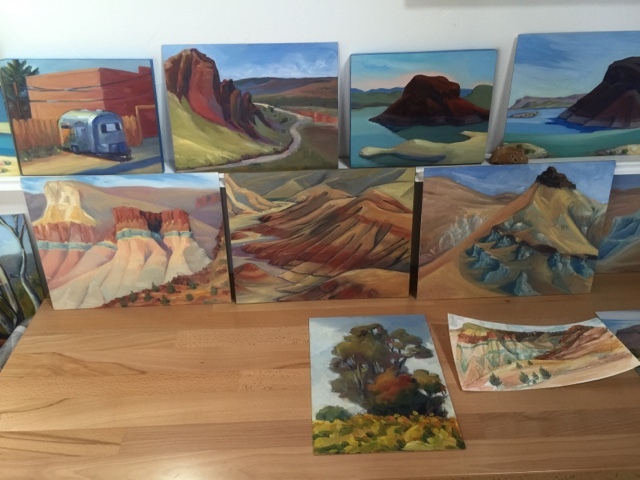 Gathered my paintings, photo reference and sketches from my Residency in John Day Fossil Beds; set up 2 big easels; selected an 18x24 maple, cradled panel by Trekell; and worked up a series of thumbnail sketches to decide on the composition for my new painting. First of the final paintings, the last chapter, of my National Park Service Artist Residency. First weekend in a really long time that I spent in my studio. I'm very happy with my start today and it was fun! I was so happy out there! Enough time has passed that I can now objectively look over my paintings and even think (somewhat) fondly of the moths that would attack my hair at night. It's always a bit of culture shock when I step back into my 'life' after a long trip. Weeks of painting and driving, my only concern really: where to paint, shifts abruptly to alarm clocks, public transportation and sitting. Sitting on trains, sitting in traffic, sitting at my desk. I'm now through the 'shock' phase and excitedly in the what comes next phase! I LOVE this phase! First, I set out all the paintings. I'm very pleased! These are the New Mexico and Oregon residency paintings lined up together - a pretty nice set! 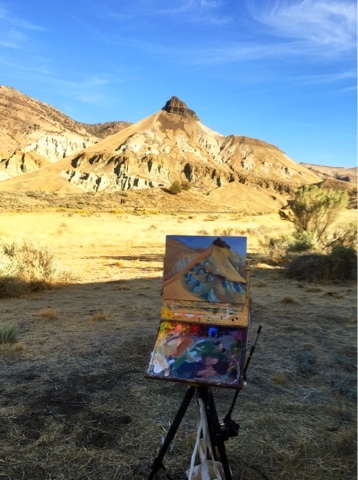 I've also downloaded, and then uploaded, all the photos from John Day Fossil Beds; selecting some to print to use as reference for the paintings that I'll paint in my studio. This is an exciting time because I see finished paintings in my head... Combinations of my Plein air pieces, mixed with photos I've taken, and hopefully - HOPEFULLY - some images from Native stories... They all come together as rich images in my mind. The next, next phase is a frustrating phase (ha ha! so true!) where I try to reconcile the imagery in my mind with what I actually paint. I always get to the right place eventually but inevitably there is frustration and doubt on the road to I LOVE IT! I'm so grateful for the Residency experience in Oregon. The family that hosted me at their delightful B&B, Lands Inn. The Park staff that fielded my many questions and provided me with wifi and respite from the heat. This coming weekend I'll order the photos, clear out any distractions in the studio and start sketching out my paintings! I'm really looking forward to this! The John Day Fossil park is a geological treasure. The Visitors Center and historic homestead across the road have an astounding collection of plant and mammal fossils, bones, seeds, minerals, rocks etc. etc. There's also farming equipment and early settlers' home items and books. What is hard to find though is information about Native Americans that lived in the area. So history from 45-15 million years ago and from 100-150 years ago, easy, but what about 300 or 500 or ?? Not so much. I packed up my apartment at Lands Inn and spent my last night in the airplane hangar! Farewell sweet, beautiful overly affectionate kitty. Goodbye road hogging cows! I'm so grateful for the wonderful hospitality and beautiful location of Lands Inn. I can't imagine a better place to stay in the area. Friday morning, car packed, apartment and kitchen cleaned, I headed down that 5 mile gravel road one last time. Just about the time I was leaving the Ochoco Forest I could smell smoke. The sky was sooty orange brown, somewhere nearby was a wildfire. Very glad I was off the mountain! Still in search of information on any Native American Indian Tribes from the region, I headed North to the Warm Springs Indian Reservation to meet with the curator at their Museum. I didn't learn a lot but did come away with a general area to begin my search: the Paiute Indians were very likely in the John Day River area. 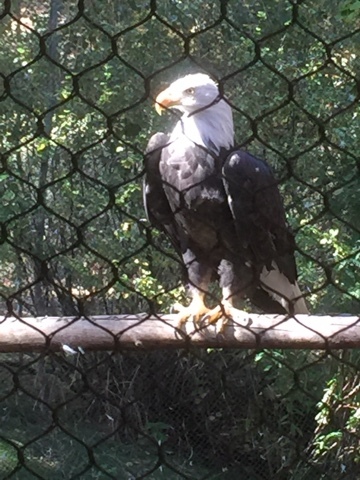 It was also suggested to me that I visit the High Desert Museum in Bend. Good thing I was headed that way! At the High Desert Museum I saw snakes and spiders and eagles and an interpretive Indian life exhibit but didn't learn much more other than the Paiutes were a nomadic, seasonal tribe: traveling for root, salmon, eel and berry seasons. Not an accident thankfully, but definitely an "incident." Heading out this morning for the '5 mile drive down a gravel road' I first have to park, get out of the car, open a gate, drive through the gate, park the car, get out of the car and close the gate. You are picturing this, right? Every day- coming or going- this is the routine. Today, I drove up to the gate and there, on the other side were cows. Maybe 8 or 11? Big cows. Waiting. Staring. Chewing. I parked as close as I could to the gate and decided to push the gate out towards the cows. I shoo'd them. They stared. They chewed. I got into my car, I said 'STAY!' to the cows. I pulled through the gate. I got out of my car. I went to close the gate. The cows stared. They chewed. ALL BUT ONE. ONE made a run for it. ONE cow trotted past my car and into the Lands Inn property. Oh no! I called out to the cow. I asked it to come here, this way, no no, come back... It stared. It chewed. Now the grass IS better on this other side of the fence because there IS grass on this side. The cow would not come to me. And I was NOT going to it! I couldn't go back to tell anyone because I was certain the other cows would all then make a go of coming in... So, I drove away. The group of cows looking concerned and more likely jealous that their buddy was locked on the other side... and had plenty of food to munch away on!! Today I drove to Clarno, the furthest section of the park, to hike, meet with Josh the Ranger/Paleontologist, and do some painting or sketching. But Clarno is heroic! It's regal! It's huge! I hiked up to the base of the palisades and completed two different trails. On the first, a couple I passed said to me, "umm, there's a rattle snake up there on the rock so watch out." Uhh, whaa- yikes! It is not easy looking up at these towering pillars of rocks and at the same time watching every step and scoping out every single rock for a rattle snake!! Sheesh. Never did see a snake but I did see fossils ;) Leaves on rocks from about 40 million years ago which is pretty awesome! Very relaxing. Just what I needed. Finally, I made my way back up the 5 mile gravel road and was relieved to see not a single cow. Safely inside MY side of the gate I unloaded the apples and made up a quick dinner so I could catch a little of the sunset. Beautiful. I was up very early so got a great start to the day and was scouting out the best view of Cathedral Rock and setting up by 8:45am. Pulled over into a few bends and turns but either the location wasn't safe, the shadows weren't great or they wouldn't be great soon... So I ended up painting in the same spot I painted the Cathedral Rock in watercolor when I first arrived. And I do love that view! I'd like to paint the whole scene sometime but for now zoomed in to that ribbon of dark oranges, yellows, creams, peach and greens... It's just so showy and spectacular! It's Cathedral Rock! My god it was hot! I thought I'd pass out so started packing things up before finishing... It's very close though! I want to knock back a bit of the intensity and value on the orange capped rock but otherwise it came out really nice. 4.5 hours, pretty long for one Plein air painting. It's 11x14. I like that there is a layering in the rocks and a layering of foreground, center, middle and a few background masses. I am pleased with that. So there she was, saying hi in the parking lot! Also, asking if I was coming over for dinner tonight ;) umm, yes. sure. Where? Was I supposed to know this? Dinner was delicious and fun, and a great change to my routine out here. But a gift of gifts, a treat and somehow a spiritual experience, came from our drive back up the mountain. It's of course very dark, Molly's driving and around a curve, through some sage brush came running 3 wild horses!!! Amazing!! A little stocky; 2 larger and one smaller/younger. So cool! Pretty serious words for a Monday! Started off the day saying farewell to the other guests. It's been so nice to have such interesting people around to visit with at night; sharing stories of our explorations and our lives. After a round of hugs, it was back down the mountain to the Visitors Center to schedule the rest of my week with the Rangers and choose the day for my on-location walk-about with a Paleontologist. 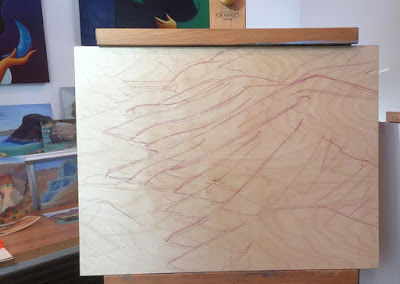 While I've been painting, sketching, hiking, taking photographs and absorbing the unique geography of the area during my residency, my goal is to incorporate these things with some of my research into Native Tribal folklore and storytelling. I want to weave the landscape with the stories and create a series of paintings in my studio. I gathered up my schedule for the week, took a walk down to the river for a peek, then headed out for my EXCURSION! Yes. I, Sara. Drove. 3. Hours. To visit the Pendelton Woolen Mill in Pendelton, Oregon!! Gorgeous climbing drive up to 5075 ft surrounded by Ponderosa Pines then back down and across wheat colored grasslands and past weathered wind blown barns. I toured. I shopped. I drove down Main Street. Saw great, big old Craftsman Homes. I found a Starbucks! I got gas. I drove 3 hours back.